One of the coolest presents I got for Christmas was GameStop’s pre-order exclusive collector’s edition of the Walking Dead adventure game. 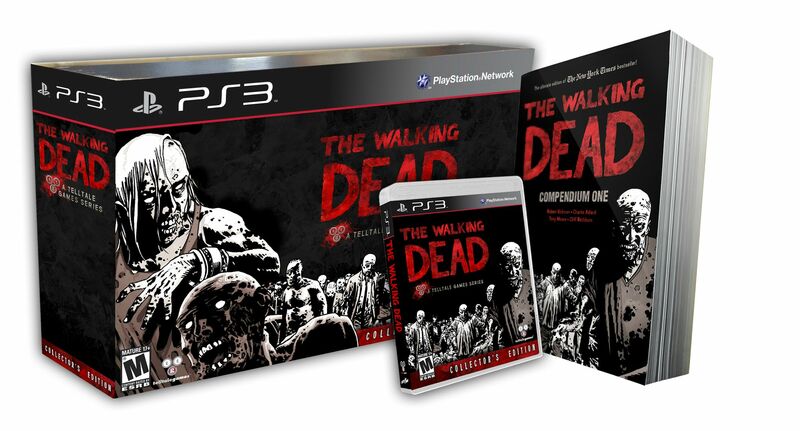 The game includes all five “episodes” originally released as downloadable games, and comes with a massive compendium of the first 48 issues of the comic series, making it a real deal at the combined price of $69.95. Since this was released as a GameStop pre-order exclusive, you may need to track down your copy on eBay, but it’s well worth doing. The game itself focuses on a cast of survivors of the zombie apocalypse that is different from the group appearing in the comic series and TV show. The game’s group is centered around Lee, a convicted murderer who was on his way to prison for murdering his wife’s lover, when the dead began walking the earth. While scavenging in the ruins of a zombie-infested neighborhood, Lee discovers a small girl, Clementine, who has been hiding out in a treehouse since her parents were away on a business trip, and the babysitter turned into one of the undead. Lee becomes Clementine’s defacto guardian, and his attempts to keep her safe through the unspeakable dangers which follow form the emotional center of the series. You control Lee’s actions as meets up with other survivors and tries to survive in a world filled with flesh-eating undead and society in collapse. Using both action sequences and action/conversation choices, you get to choose your path in the world. What’s truly fascinating is the way the story and characters react to your choices, all of which is convincingly reflected in the attitudes and actions of those around you. In some cases, a snap decision can result in a character living or dying–or set up a story conflict which will only become evident many episodes later in the series. The writing and voice-acting is absolutely first-rate, and stands head and shoulders over such wooden affairs as Heavy Rain and Alan Wake. Although the gameplay elements are executed well enough, it’s the emotionally gripping story that sets this one apart and makes it a must-play. Separately, the comic book compendium is a terrific read and worth a look even if you’ve been following the comic book or TV series closely through their respective runs. As someone who’s been a Walking Dead fan from issue #2, it was eye-opening to read the two published compendiums of the series and realize how well the story plays out when read in condensed format (My biggest gripe with the comic series is that too little seems to happen in a give issue, since most of the series focuses on character development; this isn’t a problem when reading 48 issues at a clip in the compendiums). 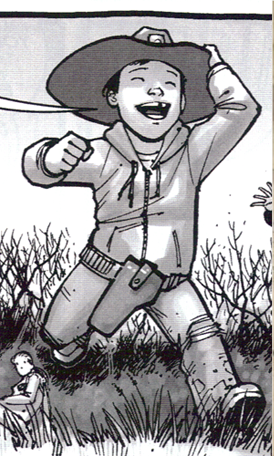 It’s also a little startling to see how well writer Robert Kirkman handles the character arcs over the long haul. As opposed to traditional comic book characters who aim for what Stan Lee famously called “The illusion of change”, Kirkman’s characters are slowly, but relentlessly altered in permanent ways by the world they live in and the horrific situations they face. The change is especially heartbreaking when you look at characters such as Carl (the young son of lawman Rick Grimes–the series’ lead). It’s heartbreaking to re-read early issues where Carl is very much a young boy and to see how he slowly changes over the course of the series in response to the awful decisions that life throws at him. In all its forms (except, perhaps, the goofy-looking shooter game which also brands itself “Walking Dead”), it’s the characters and their development which make Walking Dead a remarkable creation which rises above the expected in the world of genre fiction.